The son of Sudanese and American parents, Amir Mohamed AKA Oddisee was born and raised in the United States capital city of Washington DC, spending hot summers in Khartoum learning Arabic and swimming in the Nile. Growing up amidst the sounds of New York Hip Hop, his father playing Oud, Go-Go, and gospel, Amir took his first steps as an MC producer in the analog basement studio of his legendary neighbor, Garry Shider (Parliament Funkadelic). Convincing his entrepreneurial father that he too had business acumen, Amir laid the check from his first commercial release on the kitchen table before his 21st birthday and never looked back. Though Oddisee has gone on to perform with The Roots, produce for Freeway, Jazzy Jeff, Little Brother, De La Soul & Nikki Jean, and has MC’d on production from Flying Lotus, Hudson Mohawke and Kev Brown, his proudest moment was the birth of his critically acclaimed group The Diamond District with fellow Washingtonians X.O. and yU. Oddisee’s debut album People Hear What They See is a culmination of the duality of his life experiences, from DC internal politics to third world struggles, the line between love and selfishness, and the personal conflict between self-sabotage and progress, set to a backdrop of intricate drums, lush instrumentation, and soul-stirring harmonies. It has received critical acclaim and is in most best albums of 2012 lists. 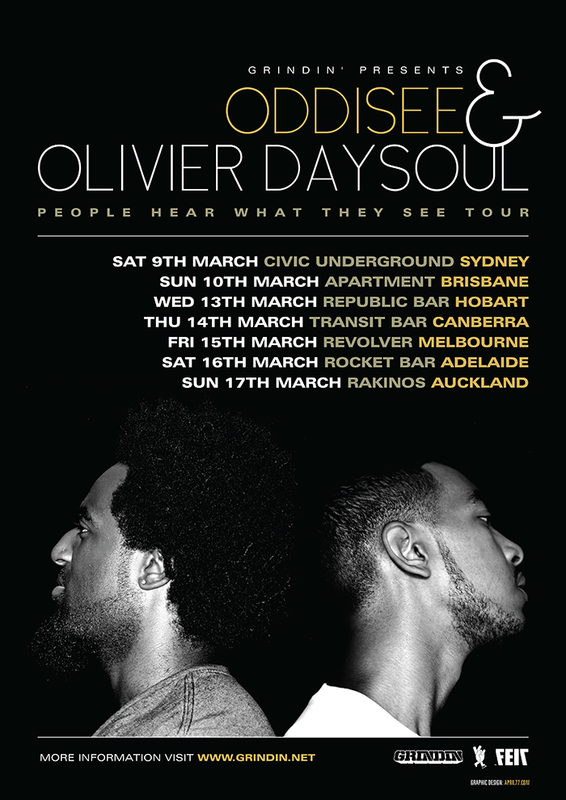 Joining Oddisee on this tour is long time collaborator Olivier Daysoul who featured as a vocalist and guitarist throughout People Hear What They See. Olivier Daysoul, (real name Olivier St. Louis,) born in Washington DC, is a Haitian American. Although a scientist by trade with a degree from University in Oxford, Oliver has developed himself into an artist with an eclectic take on musicality, merging the classics like Al Green with the eccentricities of Prince. Olivier Daysoul delivers a multitude of musical color that keeps your head nodding and your ears watering for more. Numerous artists he has worked with including, Hudson Mohawke, Onra, Dam-Funk, Mike Slott & many more, is testament to his musical diversity.